You may want to create coupon codes in your website. Providing coupon codes to users is a great way to boost user engagement. 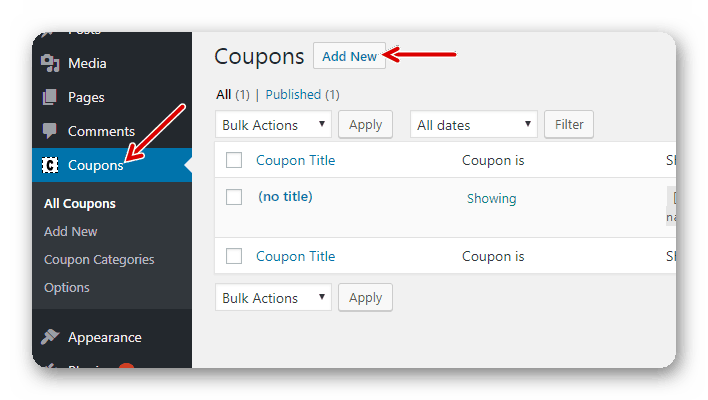 In this article, I am going to show you how to create coupon codes in WordPress. We will create coupon codes using a plugin named as Coupon Creator. But you are not limited to only this plugin, you can use any other also. I handpicked some of the best coupon code plugins, you can check them here. Many of you would say, ‘Why Coupon Creator plugin, there are many other plugins also’? I have answer of it. 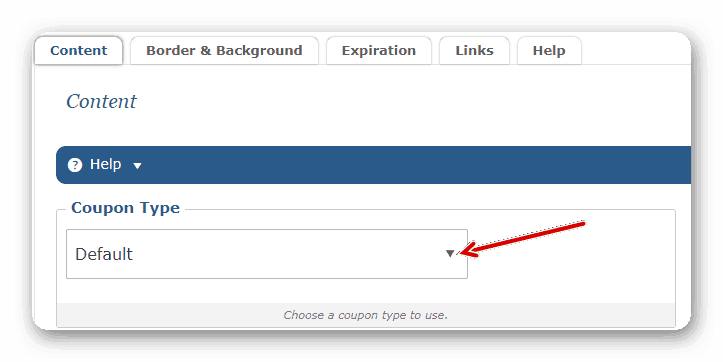 The reason for choosing the Coupon Creator plugin is its simplicity and functionality. With this plugin we can create coupon codes easily and as many as we want. I have to say that the design of the plugin isn’t good but adjustable. Also, I am working on a coupon plugin. Subscribe to newsletter and get notified when it is available. Let’s begin our work of creating coupon codes in WordPress with ease. The first step is to install the plugin. You can go to your website dashboard and there you can navigate to Plugins>>Add New>> Search for coupon creator and install it. After the successful installation, you need to activate it. You can do so on the same page or you can navigate towards installed plugins and activate it. When the activation is also completed, you will see a new menu item on the left side named as Coupons, just like this. Now lets create our first coupon code and then we will embed it in post and sidebar. The first step is to navigate towards Coupons option and click on it. On the top side, you will see a button named as Add New. Click on it and you will see a page like this. Now we are on the place where, we will create our first coupon code. You can see in above screenshot, you get a option’Enter Coupon Admin Title‘ . Remember the title will not show on the page. It is for naming, so we can find it easily when we need to edit it. So we will name it ProTheme Discount. Why I am naming it so, because it is for the product I have created named as ProTheme. The name of the product should be the coupon code name. This step is related to the design of the coupon code shown in front-end. You get 5 menu options and two of them are not of importance. One amongst them is available in pro pack and other is help links. We can say that we have 3 design options as mentioned below. Content: In this tab we can set type of coupon as default or image. Also, we can enter details of deals and terms. Border and Background: This tab helps in creating a layout of the coupon code shown on page or post. 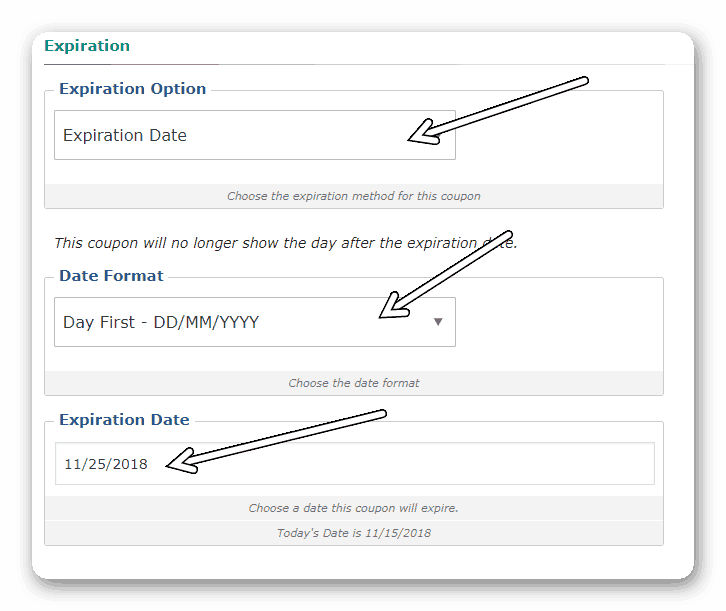 Expiration: Here we can set expiry date to the coupon code. Tab 1: In this tab you get three options, one is type, second is deals and third is Terms. You can select whether to show text or image on the front-end. In my case, i have set it to default, so text will be shown, as shown below. If you opt the image option, you will have to create the image the image first and then upload it. Say you want to advertise ‘Get 10% off on ProTheme’. So this is a deal, I am writing it in the this option. Inside this you get two more options, Font color and background color. Font color is the color of the deals text and background color is its background. Terms are simply rules which apply to the coupon code like if you are this or that then you will get discount. The second tab is about design. 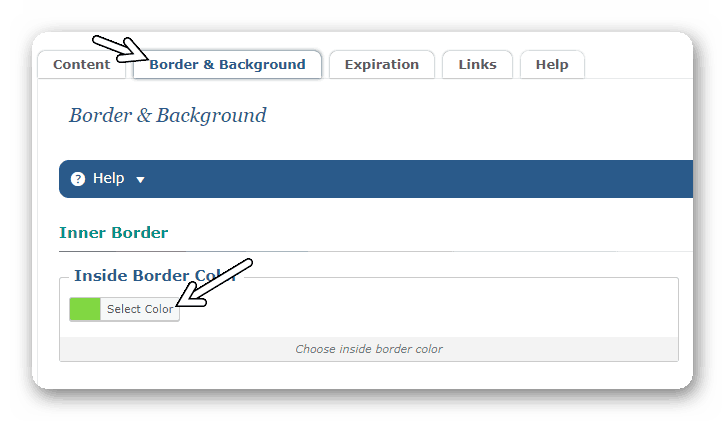 You can set border color here. As in the coupon you can see the green border line. Third tab is about expiry date. Like how much long this coupon is valid and when should it become invalid. Now the coupon is ready, you can publish it and start using it. Lets use the coupon on our post. Go to coupons tab in menu and and grab the short-code of it. Just like this. Then insert the short-code into post and start showing it. All this was the procedure of creating coupon codes in WordPress using coupon creator plugin. I hope you loved this article. Please do share with your friends.